Are You Prepared? Five Questions That Could Change Your Life. 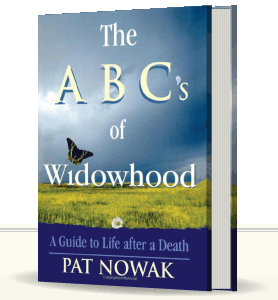 Pat Nowak, Author of The ABC’s of Widowhood Offers Answers to Questions. Are you prepared to answer the following questions if your future depended on it? If your husband or wife died today, do you know where to find the financial data you need to proceed? Do you know who to turn to in time of emotional need? What three attributes do you need to face your future? How long does it take to get over the heartache after a death? There were 11.3 million widows. By comparison there were 2.6 million widowers. Over 45% of females over 65 are widowed. The U.S. Bureau of the Census reports that over 780,000+ women and 350,000+ men annually experience the death of a spouse in the United States. As baby boomers age (currently there are 43 million people nationwide ages 55 to 74) the rate will increase significantly. With instability in the world we are experiencing death from more unusual causes (I.e. accidents, war, and unrest in the country). Currently accidents are the 5th leading cause of death in the US. There is very little knowledge of the family finances. The average cost of a no frills funeral in 1999 was $5,020 but now costs reach as much as $10,000. Even a no-frills cremation can cost as much at $3000. Insurance proceeds are meager and only stave off bill collectors for a short time. Social security provides a small window of comfort but only when there are children under sixteen living in the home. Families may end living a hand-to-mouth existence or wind up on welfare roles. The destruction of the family due to death can be tragic. No matter what their ages children are left little hope for a bright future and the bereaved continuously search for answers that never come resulting in depression and devastation of a once proud family unit. It is a simple and sobering fact. Most are unprepared for a death; yet no one has addressed the real need of this huge group of consumers; the need for first hand, practical information based on experience−until now! “The ABC’s of Widowhood” is a compelling book that everyone should read before a death occurs and is imperative reading when the time comes. This is not a book in the traditional sense; it is a dictionary for living before and in the face of death. Pat Nowak’s book is a powerful resource that gives direct, honest and succinct counsel and offers step by step emotional and financial advice on how to close one chapter in life and go on to the next. Moreover, this book is meant to be used over and over as the gems of knowledge can be used anytime in life.